I'm working on your annotation tool DSSR and trying to get the base-pair and stacking information from DSSR annotation. The base-pair part is clear enough but I'm facing problem for finding the stackings. The canonical and non-canonical stackings are not clear to me. I'm also trying to get the direction of the stackings (upword/downword/inward/outward). The canonical and non-canonical stackings are not clear to me. Where did you get the concept of canonical vs non-canonical stackings from? What do you mean specifically? It is not a term used in DSSR. In DSSR, pairwise stacking interactions are available via the --non-pair option, as documented in the -h option and the manual. Stacking interaction is detected and quantified by the overlap area of bases. I'm also trying to get the direction of the stackings (upword/downword/inward/outward). 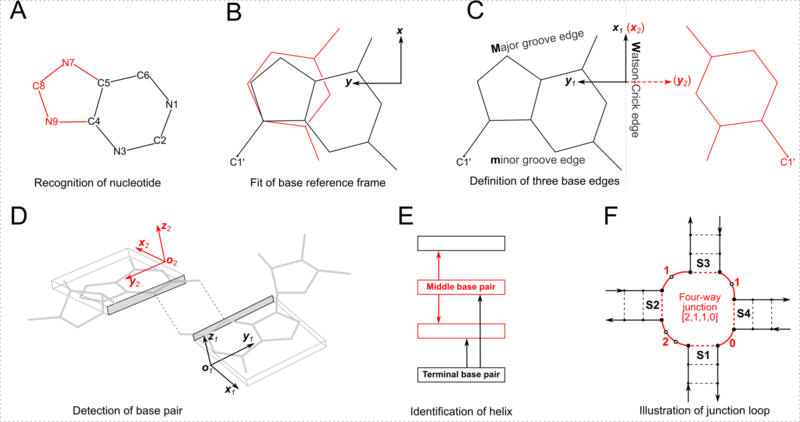 As in 3DNA , base-stacking is quantified as the area (in Å2) of the overlapped polygon defined by the two bases of the interacting nts, where the base atoms are projected onto the mean base plane9. In the output file, values in parentheses measure the overlap of base ring atoms only, and those outside parentheses include exocyclic atoms on the ring. Base-stacking interactions are classified into one of the following four categories: pm(>>,forward), mp(<<,backward), mm(<>,outward), and pp(><,inward). Here p and m represent the plus and minus faces of the base ring, as defined by the direction of the z-axis of the standard base reference frame. The symbols (>>, <<, <>, and ><) follow Major et al, except pm(>>) is called forward instead of upward, and mp(<<) backward instead of downward . Moreover, the inter-base angle is reported; closer to zero means the two bases are nearly parallel. Basically, each base has two faces (just as a coin). See Fig. 1 of the DSSR paper, attached below (also the 2003 3DNA paper). Each z-axis has a minus--->plus directionality, and there are 2x2=4 possible combinations of two bases in stack, as noted above. Thank you for your quick response. I was just trying to compare the outputs from MC-Annotate, RNA-View and DSSR. There is something 'adjacent' and 'non-adjacent' stackings showing in MC-Annotate. I mistakenly wrote 'canonical and non-canonical' for these terms. I'm extremely sorry for my mistake. Can you please help me to compare the 'adjacent and non-adjacent stacking' of MC-Annotate output with something in DSSR output? In DSSR output, the fact that stacked bases are covalently connected via a phosphodiester bond is noted by the keyword "connected". For example, for 1ehz (a tRNA), you'd see the following in DSSR output. For entry #68, the stacking between G51 and U52 is marked by connected, while the other two entries do not. It is up to you to compare the DSSR output with that from MC-Annotate. You're welcome to post your finding here for the benefit of other viewers of the thread. But I cannot be able to get the meaning of c.H, t.H, c.S, t.S, c.W, t.W - what is the . (dot) here? Can you please explain me. You're welcome to ask any DSSR-related questions on the Forum. On the other hand, please respond to my follow-up questions, for the benefit of all parties involved. Please read the DSSR User Manual (specifically section 3.2.2 "Base pairs"). Let me know how the corresponding description can be improved. The dot symbol denotes cases where edges or orientations cannot be defined (see bp #7 in the list of base pairs on Page 14, and Figure 5(D)).